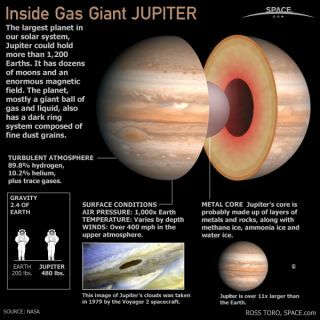 Find out what makes Jupiter tick, from its crushing atmospheric pressures to the Great Red Spot in this SPACE.com infographic above. Jupiter has dozens of moons, including the four large Galilean moons discovered by famed astronomer Galileo Galilei. NASA's Galileo probe was the first mission to study the planet in-depth, and a new mission - Juno - is en route to the gas giant. The European Space Agency also approved a new mission, the Jupiter Icy moons Explorer probe, to launch toward Jupiter in 2022.